If you watch The Apprentice on the BBC then you will have seen the would-be apprentices desparately bargain for discounts in last week's episode. (1p off a top hat was a record low discount for any series, I think!) And quite understandably, some of the suppliers in the program refused to give any discount at all: this is the price of our product, they said, so pay it. Fortunately, in in the "B2B" world of commerce, discounts are more readily expected and sometimes given. Although it is an interesting point: if a software company is selling their database for x then that is obviously what they think it is worth, isn't it? 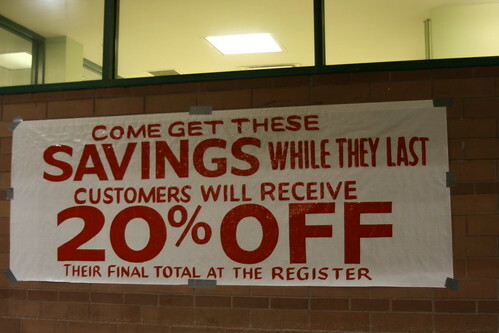 And if they are prepared to offer a discount, then why wasn't that the price in the first place? 1. Purchase time is the best time to get discounts, so if you expect to increase the number of your licenses later, bargain at that time! Suppliers will often give discounts when you are actually buying their system, whereas once you are a client, it will be far harder for you to bargain at that time to get discounts on further licenses. So, if you know that even though you are going to start with n concurrent users but you feel you may well increase that number within, say, 6 to 12 months, then see if you can negotiate a discount on those additional licenses at the time of your purchase. You need to agree a timescale for when any such discount structure is valid – it’s not fair to expect a supplier to offer an open-ended deal on that. If you do get an initial quote and then, for whatever reason, the supplier offers you a second quote at a discounted amount, then the first thing you should do (unless you know you are getting a different proposal) is check with a fine toothcomb if you are getting exactly the same proposal as you did first time around – exactly the same software with the same licenses and modules, and exactly the same services with the same number of days, level of support staff and so on. And if so, great – that’s a proper and decent discount. But if not then go back and point that out to the supplier – a discount that has actually cut down on software or services isn’t a discount at all, it’s a revised quote for a different solution. Give them a chance to explain or make amends but if they won’t then you need to consider whether the new quote is really what you want. Don’t get hoodwinked! One other thing to consider around discounts is if a supplier offers you a huge discount and it is pretty much for the same solution as they were previously proposing. Especially if they have done this unprompted because you have just told them that you don’t want their database. This may sound like a wonderful occurrence (!) but do take a few moments just to consider why they are doing that. Is there a genuine reason that they are offering you such a large discount or is there some desperation on their behalf? I would suggest that you do consider carefully before you sit down with them again. I do know of instances where this has happened and it has worked because the supplier has been able to explain the commercial reasons for such a difference but in general I have found that clients are quite suspicious of such instances and even a little disgruntled. (Why didn’t they offer me that price in the first place? How much profit were they making originally?) So just tread carefully, research other sales they have done, discuss it closely with the supplier. And if at the end of that you are not comfortable then walk away – it isn’t worth the risk; but if at that point you believe beyond any reasonable doubt that you really are getting a good deal from a good supplier then go for it! 3. Why and when should you expect a discount as a buyer? Of course, there are very good reasons for suppliers to offer discounts: for a new supplier in the market, they may want to encourage early adoption - also helps justify the higher risk for you as a client; for a salesperson who is trying to meet their quota, there may be times when they are prepared to take a hit on the price; for competitive reasons to beat a signficant competitor for a significant bid; as a final piece of encouragement for you to sign before a given date; in recognition of entering a new sector for the supplier and so on. And of course, if the supplier normally sells to for-profit companies then they may give a discount to charities and nonprofits, which is obviously fair and great to have. What I don't think is so valid for buyers to do is to just say, "Give us a discount and we'll be a reference site for you". I would hope that whatever the case, if the supplier ultimately does a good job, then you would consider being a reference site anyway. I think discounts work well when, as a buyer, you have selected a preferred supplier but that supplier might have quoted a significantly higher cost than your second choice. In which case, it is perfectly fair to go back to your preferred supplier and ask them for a discount. Even then, depending on the cost difference, I wouldn't necessarily expect them to meet the cheaper supplier's quote - after all, they might cost more because they are better - but you could certainly expect some allowance to be made. Yeah i agree with you that if someone is offering you a product or software product at highly discount rate then you should check if it is offering the same product as the original one. As the supplier of the most widely used CRM for associations and also a great many charities (iMIS CRM) for the last 17 years or so, i am perhaps well placed to advise on how to get the best deals. Broadly the advice given in this article is good advice. As a supplier we usually want something in echange for a discount. Often it will be closing an order by a specific date, or sometimes, we ask for the promise of a committment to a second phase. If you need longer term support and can pay up front you can expect a discount. If you can pay for implementation hours in advance you can expect a discount. If you take less beneficial payment terms you can expect a discount. Though it is often possible to play hard ball and extract a particularly good discount when negotiating to buy, this can often mean that when you are in a less powerful position, good deals are less easy to come by. There is an equilibrium that needs to be obtained over many years and curiously, the overall relationship and teamwork over time is much more important than just cash. The supplier needs to charge sufficient to maintain staff and overheads and make a reasonable operating margin and the customer needs to feel that they have value for money. Perhaps the best advice is to speak to references about the financial nature of the relationship with the supplier and also look at published accounts to see if the overall margin in terms of profit is much higher than industry average!